The EcoHitch® stealth hitch for the 2008-2014 models of Subaru Impreza WRX and Subaru Impreza WRX-STI is designed to be completely hidden when not in use because of the ability to remove the reciever once it’s installed so you don't have to see an unsightly crosstube underneath your vehicle. With this hitch for Impreza WRX/WRX-STI you will be able to bring your bikes, extra cargo and more. Rated for 300 pounds tongue weight and 2,000 pounds towing weight, this Subaru Impreza WRX trailer hitch is full of high-performance that will be able to keep up with your WRX and WRX-STI’s ability to escape limits. *For 2008-2014 Subaru Impreza WRX wiring harness, click here! Ensure your wiring harness does not drag on the ground by visiting our Eclipse trailer wiring bracket page. *For 2008-2014 Subaru Impreza WRX wiring harness, click here! With exhilarating agility and breathtaking performance, you need a Subaru trailer hitch that will be able to keep up with your Subaru Impreza WRX and Subaru Impreza WRX-STI. The Subaru Impreza WRX and WRX-STI EcoHitch® Stealth hitch makes it so you are getting exactly that. Designed to fit the aerodynamic contours of your Subaru and be as lightweight as possible, the EcoHitch Stealth hitch is there to give you surprising versatility to help you see the world in a whole new way. 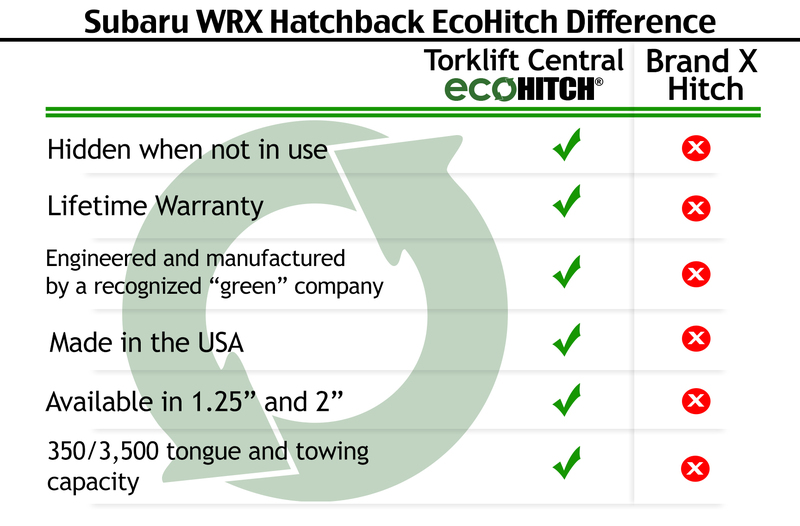 The Subaru Impreza WRX EcoHitch® stealth is designed to be removable when not in use, so no one will know you have a trailer hitch installed unless you are in the process of using it to haul your bikes or extra cargo. This WRX hitch for your Subaru Impreza WRX and WRX-STI complements the body of your car without changing its style or efficiency. Available in both 1.25-inch and 2-inch receiver sizes, you won’t have to leave anything behind with this hitch for Subaru Impreza WRX and WRX-STI and will be able to choose between many different kinds of bike racks and cargo trays to bring all your essentials.